I don't know how many of these I plan to save, but I like to have all these sites on my bookmarks toolbar for easy access. Surely I can't be the only one who works like this. Why does this site look so “sketchy”? This site was created through the open democratic process at Stack Exchange Area 51, and it is currently in beta. The site is still in the process of being defined and constructed, so a temporary placeholder design will be used until the site is fully formed and ready to leave beta. Once the site is no longer beta it will have a logo, domain, and design of the community's choice -- see our meta-discussion site if you have ideas or feedback! The favicon is being used not only by bookmarks, but also by browser extensions, the new StackExchange.com/sites, and many StackApps. With all of the smart people that are working on this I am sure they can come up with a way to differentiate the sites by using initials, colors, or unicorns. Even just feeding Beta@cooking.stackexchange.com through the Gravatar Identicons generator would be better than using the same icon for every beta site. Not the answer you're looking for? 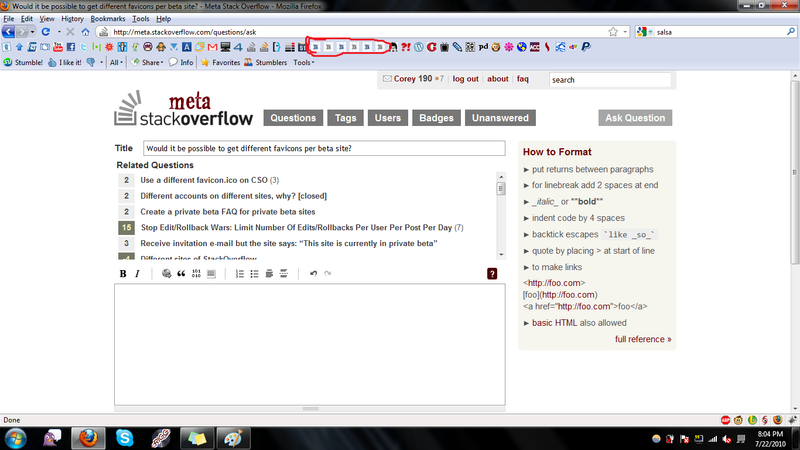 Browse other questions tagged feature-request status-completed beta-phase favicon . 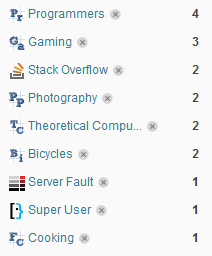 How do I get a list of sites where I am a “beta user”?